Spring is here and there is nothing I love more than having pastel nails. Gone are the darker shades, and now we have lots of lovely peaches, purples and baby pinks. Elegant Touch are constantly releasing new shapes, styles and colours when it comes to their false nails, and so I thought I would showcase some of my favourites for this time of year. 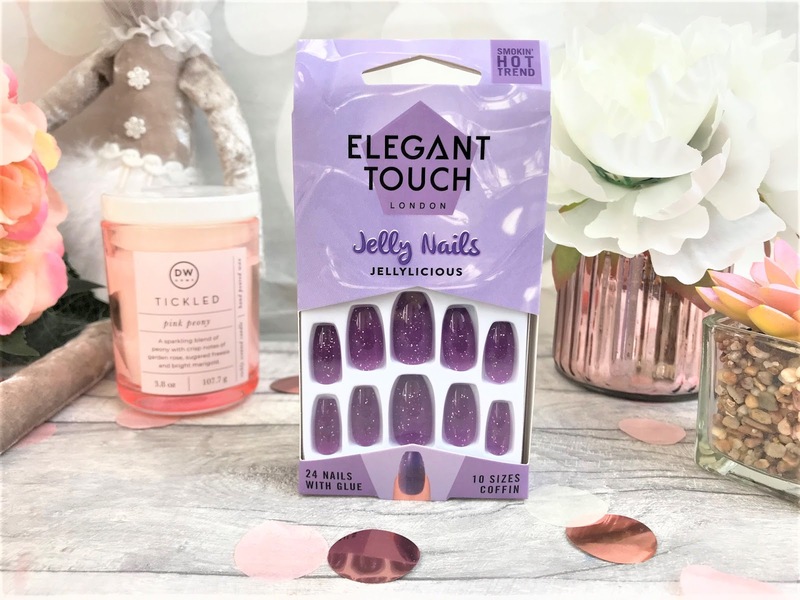 I am going to start with one of the funnest sets, the Elegant Touch Jelly Nails which I have here in purple. These jelly-effect nails come in a coffin style shape, and have flecks of silver glitter running throughout them and I definitely haven't seen anything like this before. 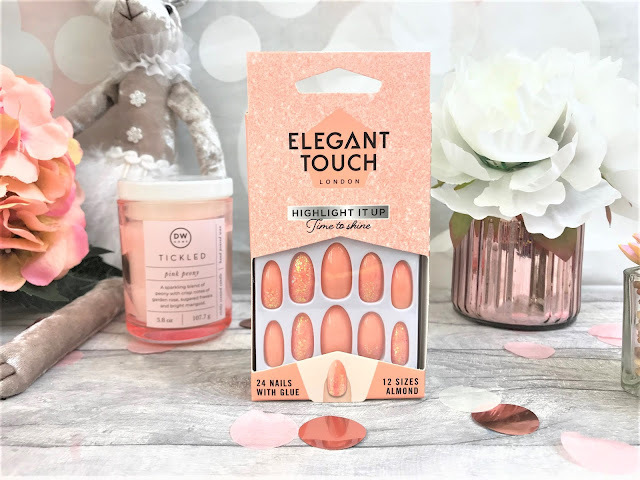 The packet contains 24 nails, in ten sizes, along with a good sized bottle of glue, so you won't have to worry about filing them down to fit your nails, as you get those ten sizes to choose from. Due to them having that jelly effect, the nails are a little sheer, and the coffin shape looks super cute and polished. 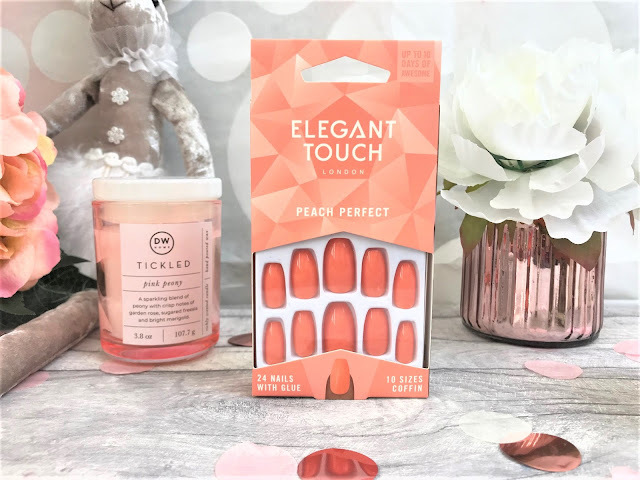 Sticking with the coffin shape, we have the Elegant Touch Peach Perfect Nails, which are plain, glossy nails, which again come in ten sizes with 24 nails and that ever-handy glue. I love this colour, as it just screams Spring and Summer to me, and coral is the colour of the year according to Pantone. 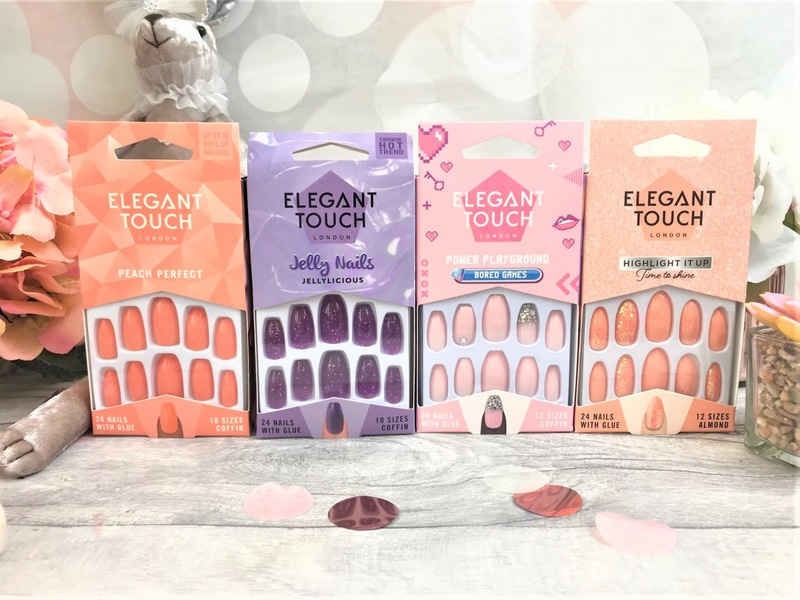 With all of the Elegant Touch nails mentioned today, you get up to ten days wear time, and at around £5-8.00 per pack, that is such good value compared to if you had them done in a salon. The prettiest ones have to be the Elegant Touch Power Playground Bored Games Nails, which are again coffin shaped so they elongate your nail beds and fingers beautifully. 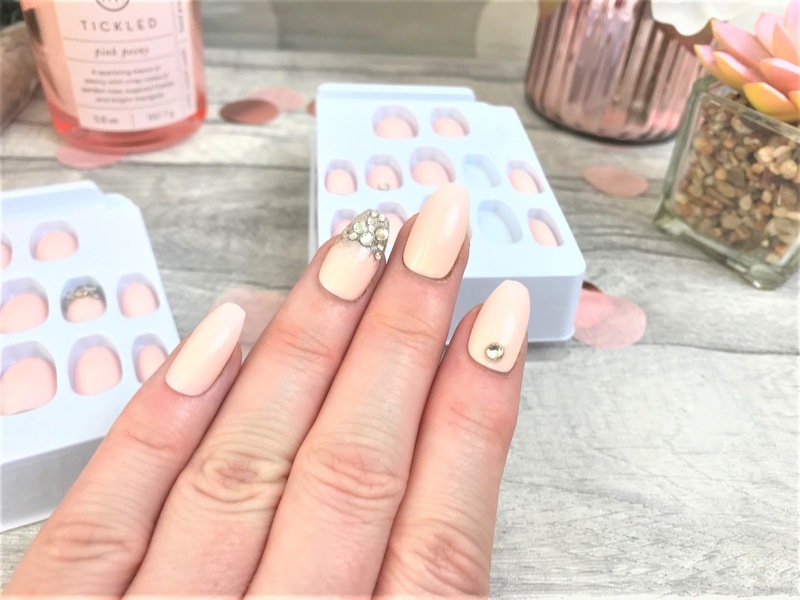 They are a soft baby pink, and some of the nails have a single diamante at the bottom of them, and then others have the sweetest spray of glitter and diamantes towards the tip of the nails. I like that every single nail isn't decorated, as I like to just have maybe the ring fingers or index fingers with an adornment rather than full-on sparkle. Finally, I am loving the Elegant Touch Highlight It Up Time to Shine Nails which are a gorgeous peach shade, slightly lighter and more neon than the Peach Perfect ones. These are almond-shaped and so are slightly more rounded at the tips than the coffin shaped nails. There are some plain nails, some completely covered in iridescent glitter and some with just the bases sprinkled with glitter. I like that you can create your own look with these, depending on how glittery you want to go, they give you plenty of options. 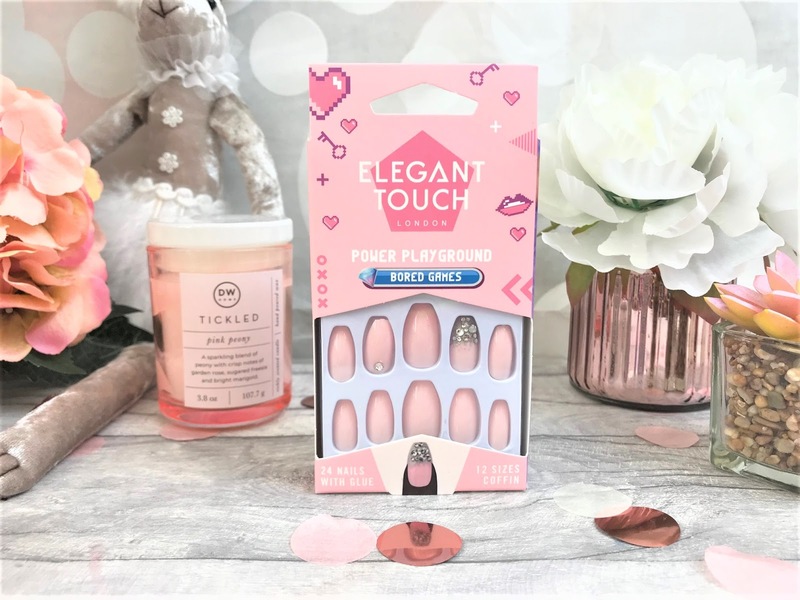 You can find Elegant Touch in-store and online at Superdrug.